In fad conscious Indonesia, blogging has somewhat lost its glister among the online community. It was very big about 8 years ago when a whole group of us including Ndorokakung, Enda Nasution, Shinta Bubu, Priyadi, fatih Syuhud, Budi Putra got together and created the first Pesta Blogger in 2007. 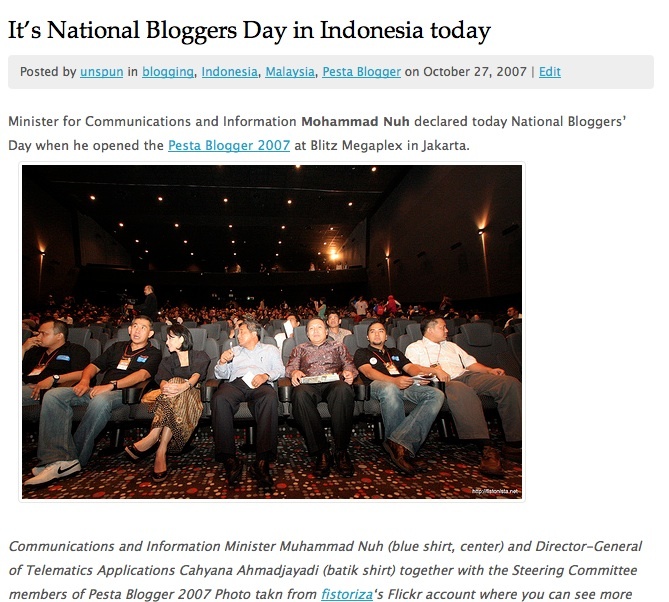 It attracted about 500 bloggers from all over Indonesia. Then came Twitter and Facebook and all of a sudden everyone was in social media. It was easier to express thoughts in 140 characters, Facebook was more entertaining, fast and easy to use and blogging’s popularity waned. By 2011, the last year of Pesta Blogger, we had changed the concept to ON|OFF but the nature of the online community, once a close-knit and supportive group, had changed. It was now more diffused, and everyone was doing their thing. All sorts of organizations were also trying to organize their blogging/social media event. The space became a red ocean and it looked like a good time to move on for my company maverick, that had been organizing the Pesta Blogger series of events for seven years. So it was with a pleasant surprise that Unspun received an email last week from the Langsat Community inviting him and other for a Muktamar Blogger, an event traditionally held for bloggers to get together on the eve of Pesta Blogger. With Pesta Blogger gone they are still holding this event to celebrate blogging. Brings back many memories and Unspun for one plans to go there to catch up with some old friends, shoot the breeze with others and bring Unspun Jr there so that he can have an idea of that species of humans known as blogers. Who knows, he and his generation might be organizing Pesta Blogger 2030 when the fad cycle comes round again? This was the invite letter and if you’re free betweek 11am and 5pm today drop by Taman Langsat to check the event out. Besar harapan kami, sampeyan bisa hadir dan ikut meramaikan acara. Aduh ya ampun ketinggalan berita gan, maaf baru tau infonya. And why don’t Ahmad Hamidi go back to Jogjakarta?